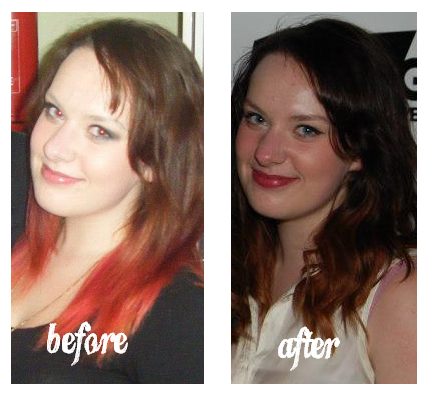 I'm a hair dying addict; I'm constantly changing up my hair as I get bored so easily! I have wanted to try the Garnier Olia Hair Colour since it was released here in the UK and I finally got myself a box of it when I decided to try and get rid of my dip-dye. The Olia hair dye is an oil-powered home hair colourant which is supposed to improve the colour process and condition the hair. One of the interesting points about this dye is that it contains no ammonia. Ammonia is present in many home hair colours as it causes the actual dying process, but it causes high levels of damage to your hair by damaging the cuticle and, therefore, the quality of your hair overall. Not nice stuff! Olia uses an Oil Delivery System, as opposed to the chemical ammonia method, to distribute the colour onto your hair meaning it should be less damaged afterwards. My hair was originally dark brown with a faded pink/red dip dye (see pictures later in post). I wanted to try and even out my dip-dye and hopefully get my hair one solid colour but I knew that no dye could do that in one go (unless I wanted damaged hair!). I was intrigued by Olia as I thought it might be a better and healthier option for my over processed hair. The dying process is fairly straightforward and if you have dyed your hair at home before you shouldn't find it difficult to apply (always follow instructions in dye kits and do an allergy test). I liked that the formula didn't drip everywhere as it was a creamy consistency, meaning no weird streaks of dye down my neck and face. It was quite a strange experience having the colour on my head because it was noticeably more oily on my scalp. After washing out the dye, my hair was noticeably softer and silkier and I felt the oil had really conditioned it. The colour had worked on my natural hair but the dip dye just turned an auburn-brown - I didn't mind as it looked quite nice. You can see in the pictures below, my hair does look glossier. *sorry for the bad quality pictures, it's all I could find! Unfortunately the effect didn't last; my hair soon went back to it's dry condition after one wash but I think this was due to the bad condition my hair was to start with. I had no trouble with the colour process, the colour was lovely and easy to apply, but I wasn't too blown away by what my hair felt like after which was the whole reason behind buying the colour. It is an unusual product and I can't deny that my hair felt in better condition than it had when using other brands of hair dye. I'd recommend this for those of you who have hair in a better condition - if you have over-processed your hair you're always better off seeking professional advice from a salon!